Today, and throughout this year, the Detroit Journalism Cooperative (DJC) will explore whether the social and economic conditions that sparked the tragic events of 1967 have improved in Detroit. In the wake of recent unrest in Ferguson, Baltimore and other American cities, such questions are hardly academic. Today's topic: Poverty. "I watched an old black man cry"
Excellent synopsis. Looking forward to this series. I wonder if this type of reporting can be truly accurate when trying to relate to current day Detroit. Can anyone properly frame history relying on only visuals with a sentence or two of caption and accurately informs a reader or does it simply play to the emotions in our current settings? What about the narratives of those who lived in that time and place? Were the ‘war factories’ of Willow Run, Ford Rouge, etc. 'Detroit' factories? Were they even providing significant numbers of Detroit jobs or were they drawing on western Wayne county and Washtenaw, was Rouge draw Down River, did the Warren Tank plant draw on Oakland and Macomb? Are we well enough informed to say the ethnic issues were the major influences on where Detroit is today? How many [including the authors of the series] even know that the ‘hunkies’ and ‘pollacks’ suffer severe prejudices? Why don’t we hear about that, were they assimilated to overcome such treatment? 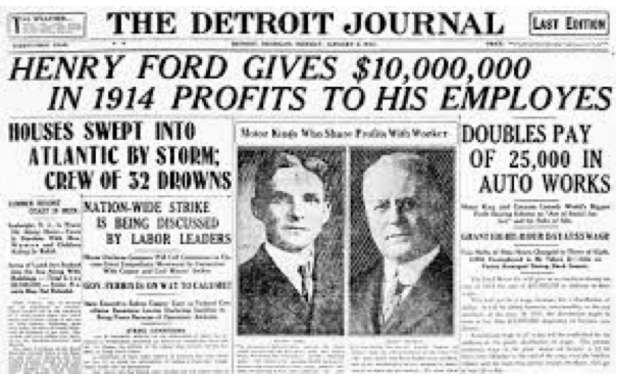 Couldn't that be a factor in what Detroit is today? Could it be that this story is more about the 'war' to resist change, not one about social isolation, but social insulation? Was Detroit ever the 'big' urban city the likes of New York and Chicago or was it simply an over sized suburb, with its social enclaves and not one of a high density living, and was it ‘political leaders’ building the boundaries around these enclaves? Could pictures and captions ever describe this? What if Detroit was simply a place for drawing in immigrants to Michigan and a place where they flowed from trying to find where they could best find what they wanted, what if the politics of the 60s stopped that historic flow and prevent people finding what they wanted and prevented the assimilation into society? Could all these be factors in what Detroit is battling today? Could the pattern we see Detroit following be one that has occurred around the world through out history? Could there be lessons of how that can be change form such history? Was the Detroit employment and individual economic really reliant on the factories and those servicing them prior to 1967? Was the real change that became apparent in the 1950s really only retail catching up with what began back in the 20s and 30s. When was the River Rouge plant built and why, had the dynamics of Detroit already changed? Does this article only paint one part of the dynamics that were Detroit and it neighbors? Can this article and method of reporting only reach the emotions and leave the mind empty to be filled by those emotions? I realize that the written word is disappearing facilitated by social media, but for important issues and decisions why not try to balance emotional appeals with the written word and help readers think about what to do? Is Detroit more than pictures, are its problems more then a snap-shot headline, are there factors that were not captured, that can't be capture in pictures? Is that something this minimalist verbal reporting can't inform people of? How do we know what history is when all someone 'hears' about it is in pictures? How do we talk about it if all there is about is a granny black and white photo that claims to describe history? How do we get past emotions when all we see is something that has not facts with it so it can only be interpreted though emotions?